I did my nails two days ago :) I was bored and I haven't painted my nails in a while so yea. The designs I made for each nail was are correction from a mistake except for the thumb and pinky because I just applied a glittery nail polish on top. The middle finger with the hearts was actually supposed to be just one heart on the center of the nail, but when I drew it, it wasn't centered so I tried fixing it by adding other hearts to make it seem like it's a wallpaper-like pattern. I wanted to make polka dots for the ring finger but some of the dots didn't come out as the same size so I improvised making it have this little design haha. ps - I don't own any nail supplies besides the actual nail polishes, nail clippers, and nail filer. 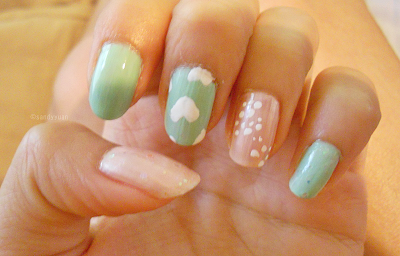 I madedrew these on with the actual brush that the nail polishes have.